Click on an image for more detail. Hand painted cotton, layered with sheer fabrics, hand and machine embroidered, couched and beaded. Flower petals individually made of layered organza, fastened with a beaded centre. The design was inspired by the delicate colors and lines on the batik fabric. 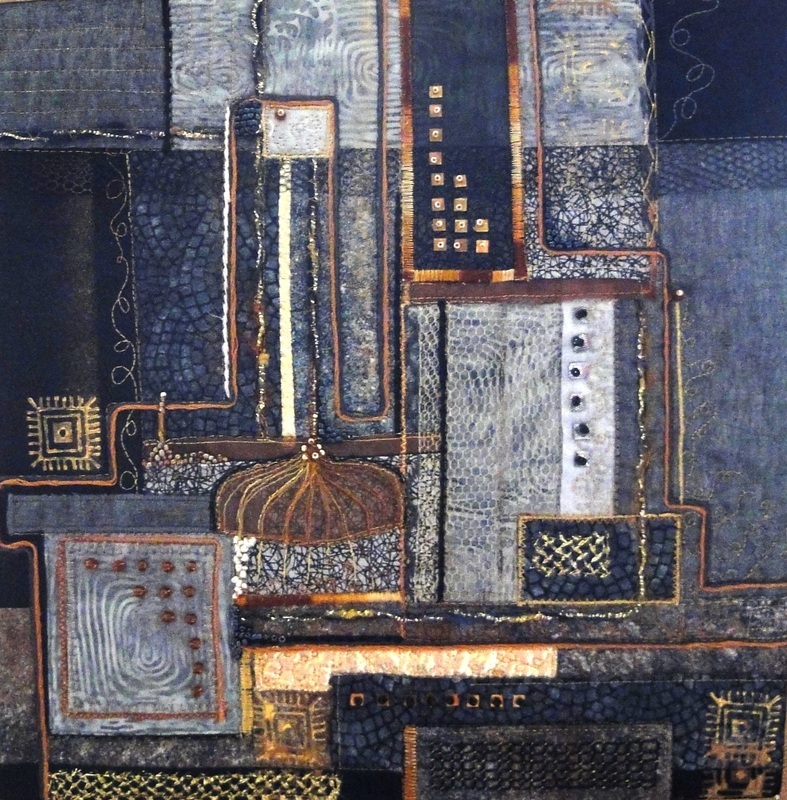 Free motion machine embroidery through layers of netting, batik, batting and backing created the quilted effect. The dips and curves were embellished with hand embroidery, handmade net, beads and shells. Hand painted on white cotton and layered with colored organza. Machine and hand embroidered. 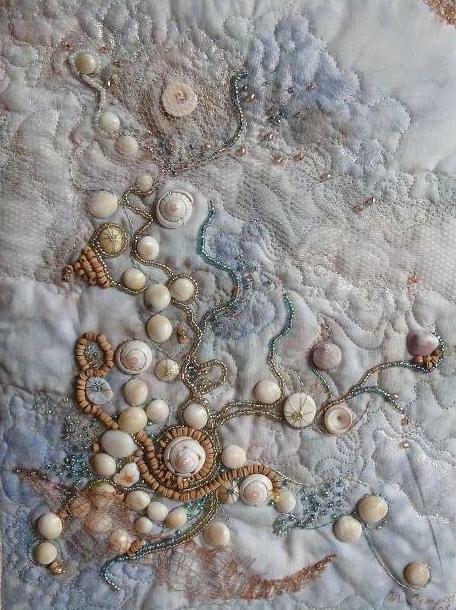 Bead and shell embellishments. Original image was photographed by me on the Sunshine coast of British Columbia. Silk background with individually hand painted silk organza petals attached. Machine couching and free motion quilting. Hand beaded. A photograph of some unusual flowers prompted this project. Fabrics with a sheen, colored organza, netting, beads, machine and hand embroidery are joined with a layer of batting and backing. Blossoms are hand painted on layers of silk habotai and organza with a gutta resist technique. The light branches are transfers of photos taken in my neighbourhood. The heavier branches are couched embroidery cotton. Free motion machine embroidery joins the layers. Individually made organza blossoms are added for definition and embellished with hand embroidery. I wanted to convey delicacy and the transformation of winter into spring. 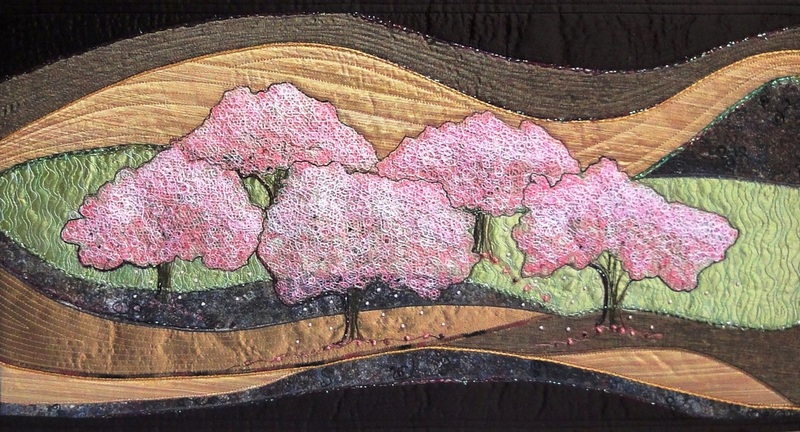 Shown at Cherry Blossoms: A Textile Translation 2011 at the Silk Purse Gallery, West Vancouver. 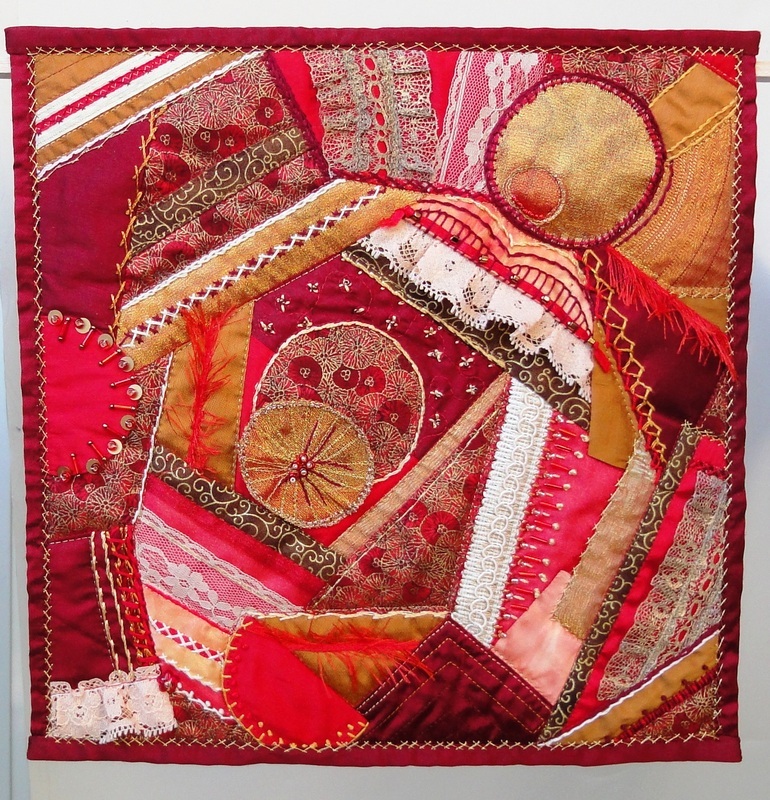 Crazy quilt technique using various fabrics and threads. Embellished with hand and machine embroidery, lace, beads and trims. 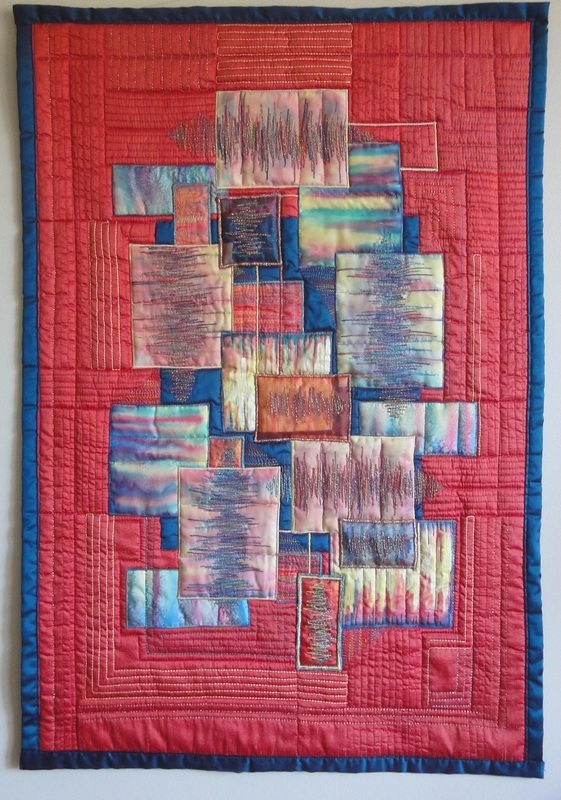 Exhibited by Visions Art Museum at the San Diego airport as part of a selected group of members challenge quilts. Spring 2012. A variety of commercial fabrics and threads. Embellished with Angelina fibres, beads, mirrors and sequins. 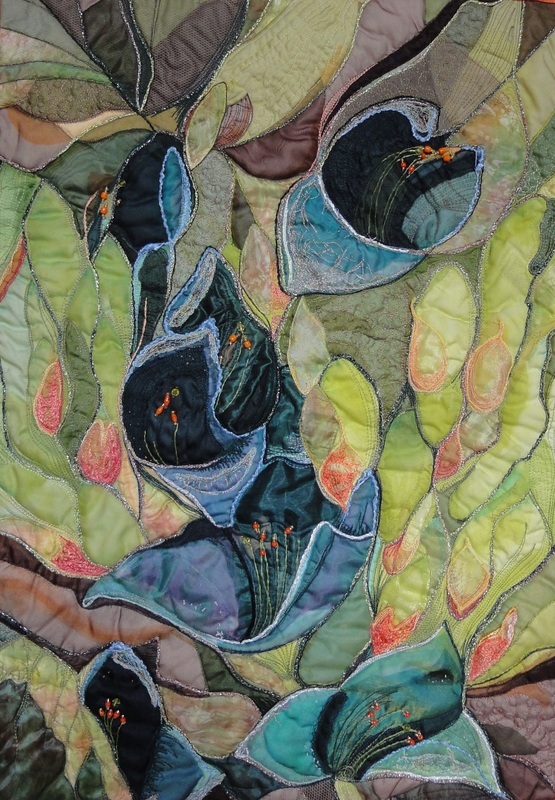 Machine and hand embroidered and quilted. Shown at Through the Looking Glass exhibit at Seymour Art Gallery, Deep Cove. 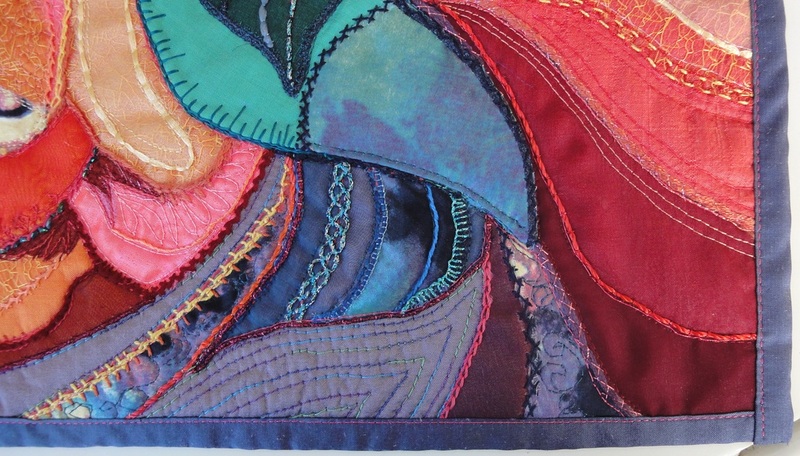 Variety of fabrics and threads; machine and hand embroidered; beaded and quilted. The "wheels" on a batik inspired this one. Indigo dyed cotton made a perfect background. Blue and orange reminded me of Southern California, where this piece was started. It is amazing how much one can create with hand sewing, an iron and fusible web in a hotel room. 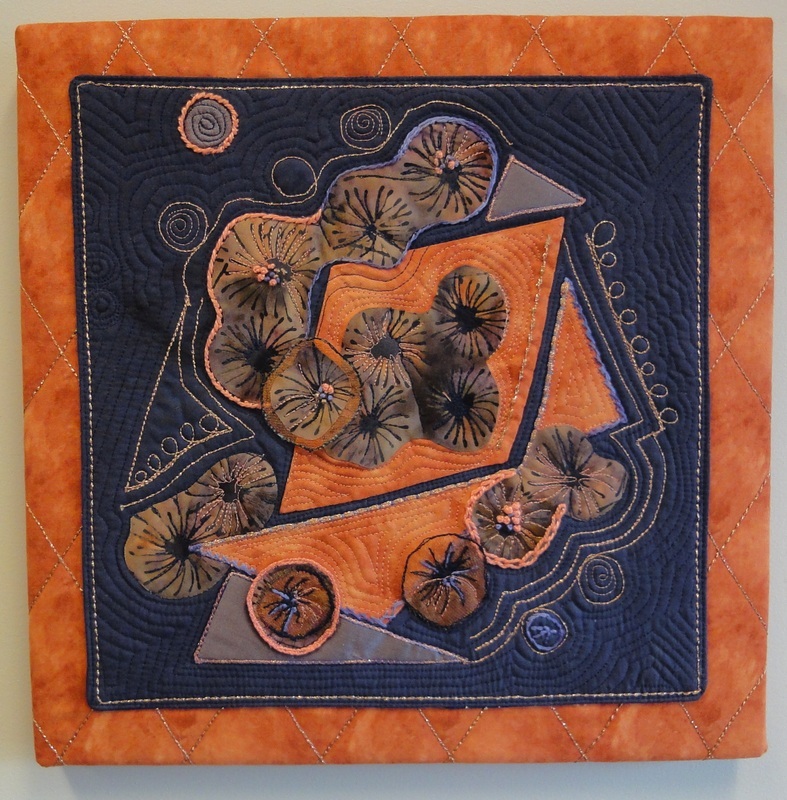 Finished with free motion embroidery and quilted with copper thread. Silk fabrics, hand painted by me, layered with sheers. Various threads. Machine embroidered and quilted. I have highlighted a detailed portion of this piece. Another hotel creation using fusing and hand embroidery. Machine embroidery added later to finish. Various threads and fabrics with a silk base. This began as an experiment with multicolored silk roving. I spread it on a piece of blue silk and used free motion embroidery and hand stitching to secure it. Beads and couching added more detail. A thin layer of batting added definition. 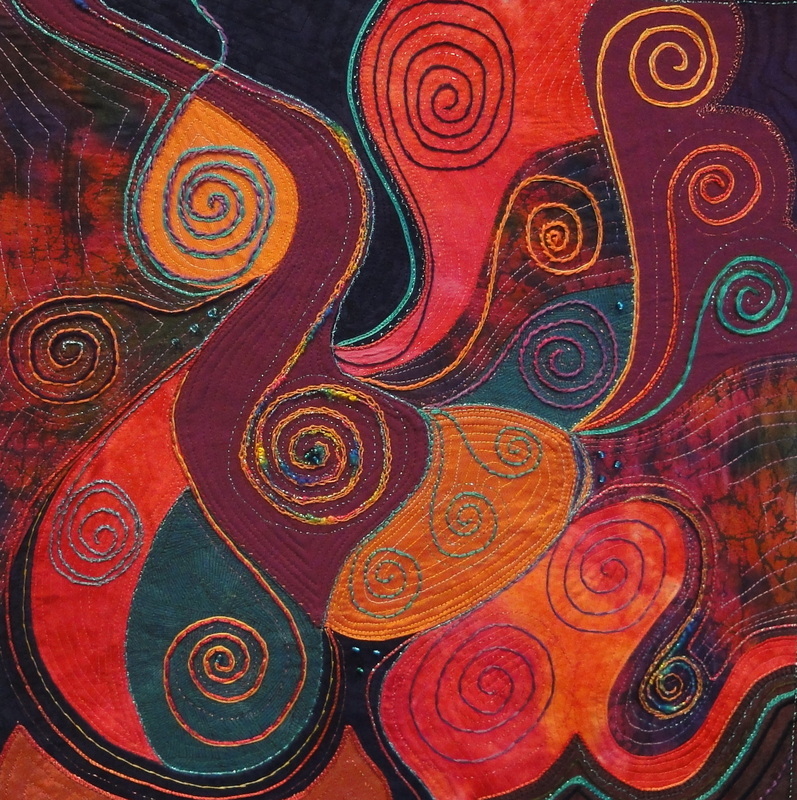 The piece was mounted on foam and then placed on a mat covered with batting and orange silk and then framed. This was my first major attempt at curved piecing. It is mainly cotton, with some sheer overlay. Hand and machine embroidery; beading and couching add detail. 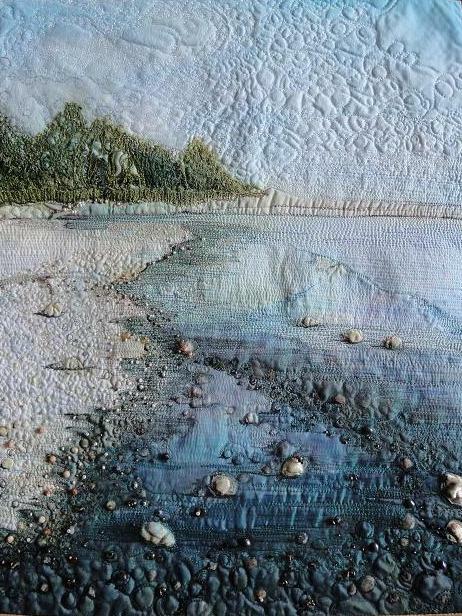 The finished piece is hemmed, stitched to a background fabric and wrapped around a canvas. 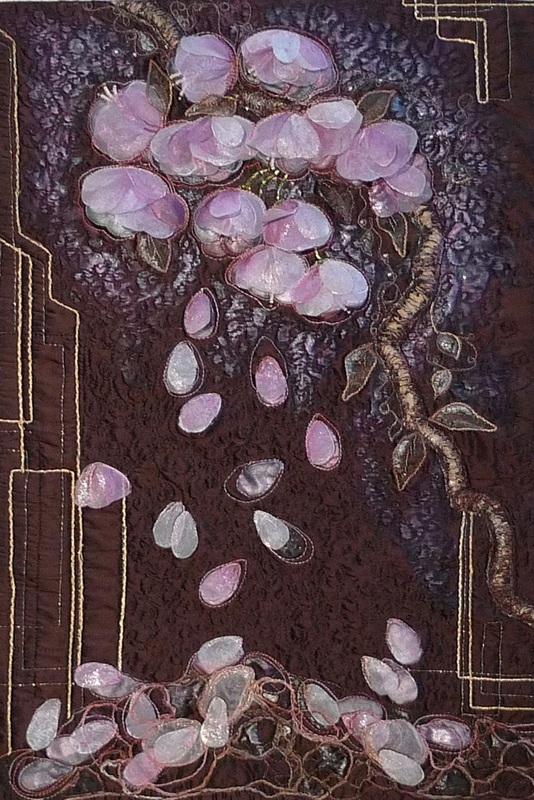 My third Cherry Blossom themed piece was exhibited at the Silk Purse as part of a city wide festival. This composition was inspired by the changing colors of spring, the cherry trees being one of the earliest blossoms. A new green also begins to show at this time. 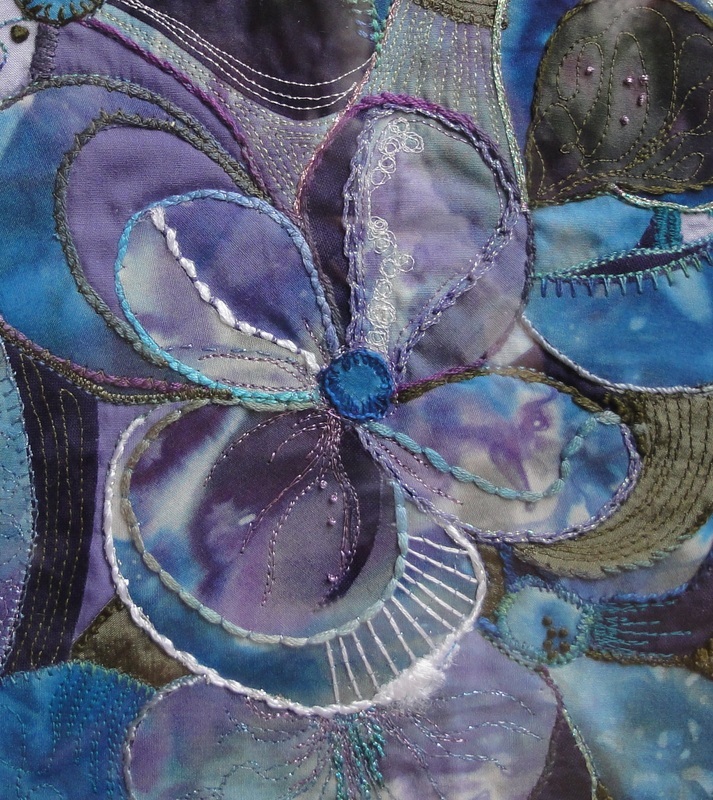 The background is applique done by fusing pieces of fabric with different fabric contents to a whole cotton backing. 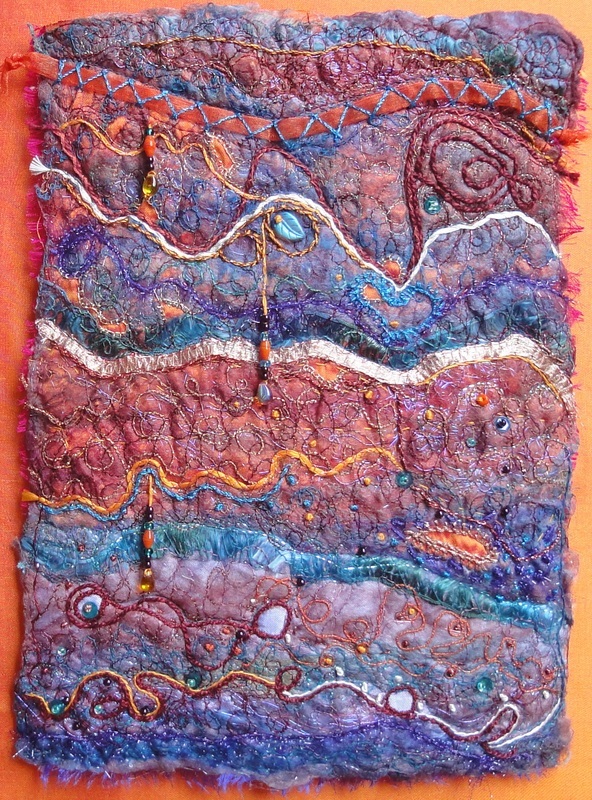 I then couched the edges by machine and hand with multicolored, textured threads. The background was then machine quilted to a thin natural batting. The skeleton of the trees was created with hand and machine embroidery. The blossoms were created separately by free motion machine embroidery on netting and soluble fabric. 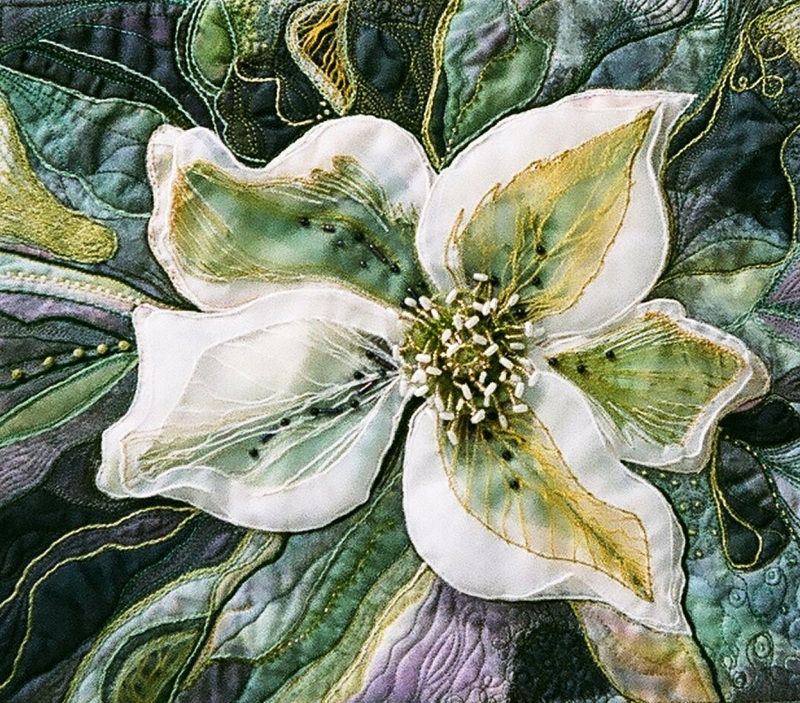 Once dried and trimmed, the blossoms were hand stitched to the background in two layers. Hand embroidered details were the last stage of the creation. The finished piece was wrapped around a foam-core board. 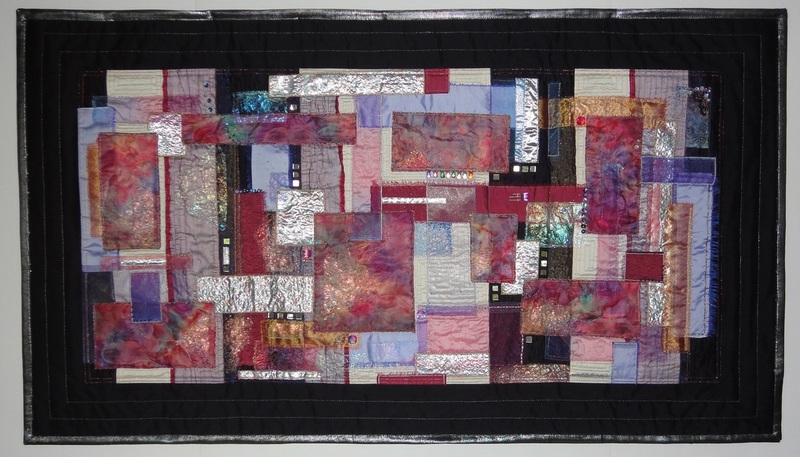 Curved piecing and fused applique with a variety of fabrics, mostly silk. 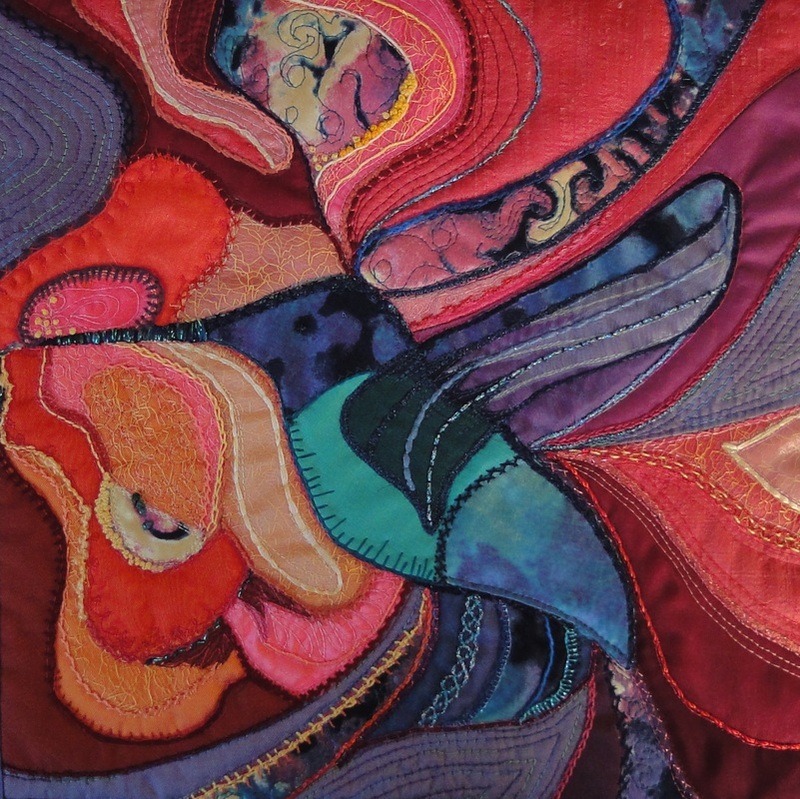 Hand and machine embroidery with cotton, silk and rayon threads. Machine quilted with the thinnest weight batting. Some details below.